Bilimkana means “house of knowledge” in Kyrgyz, but this ambitious educational start-up aims to impart more than knowledge to Kyrgyzstan’s youth. 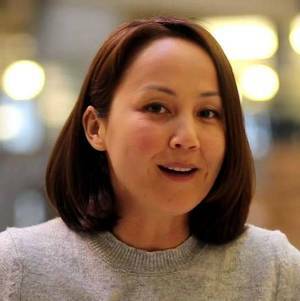 Elnura Osmonalieva is the Director of Bilimkana Foundation, a fast-growing nonprofit network of low-fee, high-quality K-11 private schools bringing quality education to underserved communities throughout Kyrgyzstan. Here, Ms. Osmonalieva outlines the advantages of a private-sector educational initiative, while also describing specific partnership strategies to support inclusive access and promote systemic transformation of the entire educational sector. What is the mission of Bilimkana Foundation, how did you become involved, and what is your role? Bilimkana Foundation was created, established, and funded by my husband, Tolondu Toichubaev, who had a dream of transforming Kyrgyzstan by providing a new kind of education to around 70,000 students. He calculated that this would be enough of a critical mass to transform and maintain Kyrgyzstan in a politically, economically, and environmentally sustainable way. Bilimkana Foundation started, and the first school was launched, in 2012. It was totally Tolondu’s project for years, and I was watching him and supporting him with advice while I was making films and going to grad school at NYU. In November 2015, he asked me to help bring the Foundation to the next level. In 4 years, the Foundation had set up a network of 10 schools, but they felt like they had to make then next phase happen—to bring the schools closer to our understanding of what innovative schools should be like. I am now the Director of the schools. It’s a very challenging and a very fun task to take on. I’ve been happily engaged full-time, working 20 hours a day, managing existing schools and creating new schools. There are many ways to support and improve educational access and quality. What is Bilimkana’s approach? Bilimkana Foundation operates a network of schools that go from kindergarten to grade 11, which is the final year before university. We come to a rural area or a district capital where there is no quality school, and we open a very nice school with a new building, WiFi, and very nice classrooms. We get the most capable teachers to work with us, and we provide training so they teach using interactive methods. Our philosophy as a school is to provide students with love and support, and create an atmosphere in which every student independent of his/her academic record is able to open up and find his/her talents, whatever they may be. We try to equip students with skills to make them independent, goal-oriented, and ambitious. The first school we opened was in Kemin, in a mountainous valley, where we had kids from 8 villages. Because this first school was so successful, we were able to go on very quickly into other regions and keep opening the schools. At the moment, there are 10 Bilimkana schools, and the largest one has 450 students. How did Bilimkana choose this approach? What has this approach meant for Bilimkana schools’ relationship with the public education system? We chose this approach first, for control; second, independence; and third, sustainability. We want the transformation in this country to start happening, and continue happening, very quickly. We as a country don’t have much time or resources as people and thus need to be very smart about our strategies. If you want to be in control of your curriculum, you should have your own school. The state is often unreliable, and you don’t know if the minister of education, who struck a deal with you today and was very favorable, will be replaced tomorrow and you will lose those schools that you invested in. It’s very unpredictable, so we try not to depend on the state’s partnership in terms of joint school operation. I enjoy my job because I don’t depend on officials to design a new school philosophy; all I have to do is listen to our students, parents, and teachers. We are open for cooperation with public schools, and right now we are satisfied with our partnership with them. For instance, we provide training, seminars, and workshops to their teachers. Then we don’t feel so guilty about taking the good teachers away from students who cannot afford it. We don’t want to compete with public schools because we are on the same mission. I have an example. The first school that we opened was on the nerves of public schools in the village, of course. They felt like they couldn’t do as well as the Bilimkana school because they did not have the money for it. But then they saw that the Bilimkana school does stuff that doesn’t cost money, like involving parents in the learning process or engaging them in school’s activities. Now the public school has copied these things. First Bilimkana irritated them but they are now learning things from them! I next want to see the schools become friends and establish a healthy competition. What are specific shortcomings of the existing Kyrgyz public education system, and how is Bilimkana addressing those? Firstly, in Kyrgyzstan, most of the schooling is still done in the very traditional or post-Soviet way, where the teacher is the main authority and students are discouraged or not allowed to challenge the authority. At Bilimkana schools, we try to encourage students to question any authority and to develop their critical thinking and analytical skills. Second, in the public system, there is a shortage of teachers in general, let alone highly qualified teachers. The first way we increase our teaching staff is through partnerships with universities. One is the American University of Central Asia (AUCA), which was established by Open Society Foundation, and the International University of Kyrgyzstan. With these, we will be developing teacher training programs. We are also paying tuition for Bilimkana and other school graduates who go and study to be teachers, and we provide over 20 scholarships each year to finance their undergrad studies. We also would like to recruit from amongst Bilimkana parents who have university degrees and a good academic record. We can then train them to become teachers and to start a new career. This way we are solving several problems—we are finding teachers, training them according to Bilimkana standards, and we are also providing Bilimkana parents with jobs. 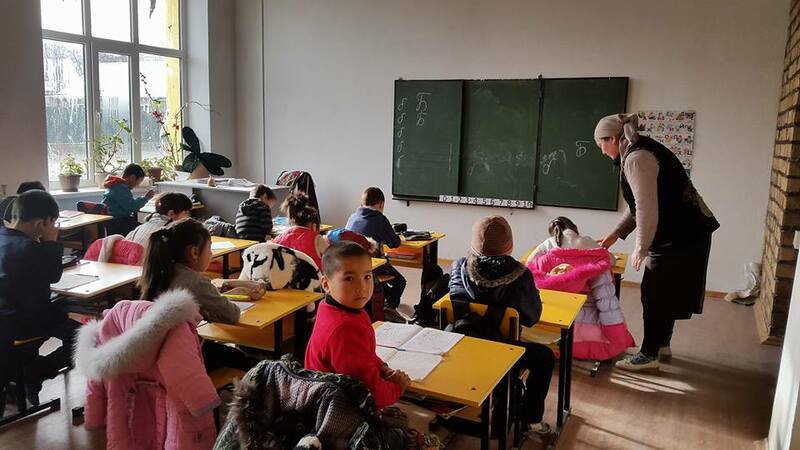 Third, the reality of the Kyrgyz public education system is that usually the schools that teach in Kyrgyz are low-quality because there is not enough literature or textbooks in Kyrgyz language, and not enough qualified teachers. Meanwhile the number of Russian schools is very small, and they are extremely overcrowded. For instance, class sizes range from 40 to 60 kids per class. In some instances there are as many as 70 kids per class. In Bilimkana schools we decided that the existing study opportunities and the job market require Kyrgyz youth to know at least three languages—Kyrgyz, Russian, and English for sure. For this reason, part of our studies is in Russian, part in Kyrgyz, and part in English. That’s why we consider Bilimkana schools trilingual. And we thought it would be great to have one more foreign language, so students have a choice of Japanese, German, and Chinese languages. Other private schools are only Russian, or the more expensive ones are only in English. There is no quality education available, either public or private, in Kyrgyz language. We also have spring camps with focus on Kyrgyz culture, teaching kids about food, how to make national drinks including yogurt at home. The parents love that we pay so much attention to Kyrgyz language and culture. They find it very important. Their kids can become fluent in Russian and English and not lose their ethnic identity. 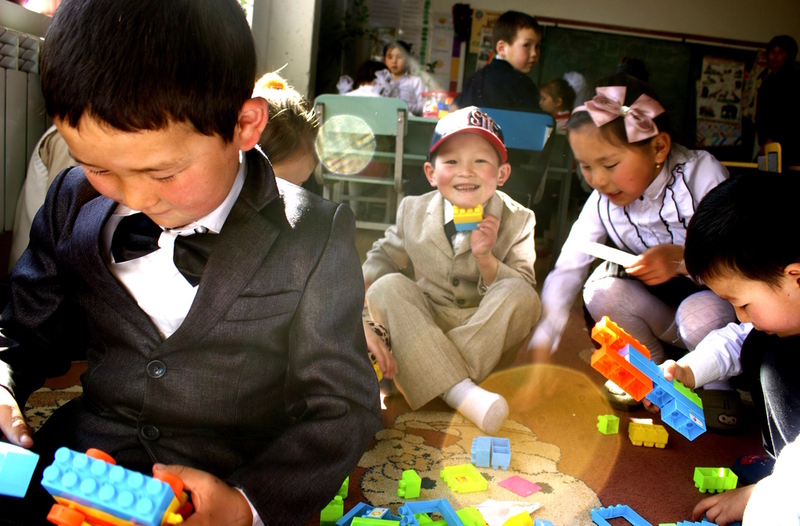 How do Bilimkana’s school fees compare to other private schools in Kyrgyzstan? How do you ensure Bilimkana schools are inclusive while still upholding your business model? The school fees run from $30 a month, including food and school bus, to the most expensive Bilimkana school in the capital, which is currently a little less than $200 a month. In comparison, the Turkish private school costs $3,000 a year, and the international schools cost around $10,000 a year and more. What Bilimkana parents enjoy is that they are paying for an education that would cost much more if the schools were organized for profit. For the quality of education, the buildings, the motivation we give to students, families understand they are not overpaying, they are actually paying a low, subsidized fee. We do provide scholarship for single-parent families, or if they have a child with a disability. We either decrease the fees or eliminate them. We also support talented kids, those who have academic or athletic achievements, to give kids motivation to excel in whatever they do. At the moment, 20% of Bilimkana students are on scholarship. Of course, the schools’ main survival tactic is to have as many paying families as possible to keep growing—but often it’s not possible given the economic situation of the community. So we discovered that some Bilimkana schools that are earning more can act as a “donor” to sponsor smaller and economically disadvantaged schools. Two of our schools are a donor school for two other schools. The parents really like to hear that their money is going to support communities in the rural areas. Right now we are working on our budget for next year, and hopefully two more schools will become donor schools next year. We’re finding other ways to provide quality education to those who can copay, and need it, and then take that income and put it where people cannot afford quality education. We launched a school with AUCA, because the university has hundreds of applicants that want to apply and pay for their education—but, because the public schools do not prepare them for this entrance examination, these students cannot pass the TOEFL and Math exams. So we decided to collaborate. In September, we’ll start a prep school with 6 classes. Tuition there will range between $3,500 to $5,000 a year, depending on the applicants’ entry score. Whatever income this school generates will go to support existing and new Bilimkana schools in the rural areas. Students playing in a Bilimkana classroom. How do you measure the success of Bilimkana schools? There is an independent organization that does national testing for all school graduates in this country. Bilimkana ordered tests for Bilimkana schools so the organization could independently test our students from K to 11. They tested each of our students, and they provided a copy of the results on every subject to the parents and a second copy to us in the beginning of the year. Then the schools meet with each parent individually, look at the test results together, and develop a strategy on how to improve the scores that are low, and what Bilimkana will do and what the parent has to contribute. At the end of the school year we do a second test to see progress and discuss how the work went. For those parents and kids who were not able to earn the desired score, we have mandatory summer schools. On a daily basis, we try to see the enthusiasm with which the kids are in school: if they are happy, if they are signing up for extracurricular activities like chess, talking club, and summer camps. We track the exchange program admittances, and our kids get selected for highly competitive exchange programs. Once the kids are graduated, the indicators are which universities they are admitted to. We also see which directors, school principals, or teachers from other schools want to come to work with us. If somebody from another prestigious school wants to come work for Bilimkana, we say we’re doing something right. What is your vision for Bilimkana Foundation and its schools? Eventually we want each Bilimkana school to become a development center for the communities where they are placed. We are always encouraging the schools to provide spaces for community events, workshops and adult classes. We want every cent that’s been put into the school to work for people in the community. For example, in certain regions, there are no birthing hospitals. Wherever we can, we would like to open a pre-natal care center inside Bilimkana schools to provide treatment and information to women lacking it. The Foundation has the ambition of building 20 more schools in 4 years, until 2020. No matter how many Bilimkana schools we open, though, I would like each Bilimkana school to be a development center for their community. I would like to see each of our graduates to succeed, and to understand that what they are learning for is not just for themselves—it has a higher purpose. Tomorrow, wherever they choose to go, they will be conscious about their personal impact. All photos provided by Bilimkana Foundation. Learn more about Bilimkana at their website and Facebook page. No Replies to "TRANSFORMING KYRGYZSTAN, ONE SCHOOL AT A TIME"